The Rose Parade Basket is a basic market basket shape with dyed reed to create unique pattern. A corsage of silk roses added to handle for accent. Valentines Day Heart made from dyed red reed and natural interwoven for color pattern throughout the basket. The Shamrock Tray is woven on wood base and color played with light green, dark green and natural reeds. The Easter Basket has twill side insert with lace border and many colors of reed. 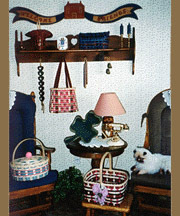 Mothers Day Sewing Basket uses 12" X 12" D-handle for the twined round base. Lid instructions also included. Fathers Day Stationary Basket is woven in dark brown, dark blues for Dad’s desk. 4th of July Picnic Basket has decorative side insert. Uses a 13" X 7" square grip handle, wood skids to protect base ware, and is lined with scarves. Back to Class Tote is ideal for a book tote. Has shaker tape handles. 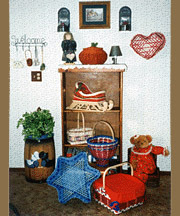 Labor Day Harvest Basket is a bowl shaped gathering basket, sitting on a woven pedestal foot. The Pumpkin Basket teaches control. Has lid with green stem and leaf. Thanksgiving Day Basket is princess style shape using 4" X 12" D-handle. Two color ideas given. The Hanukkah Basket- Star of David is a six sided star shape with the base taken from the Shaker cheese basket. Woven silver Mylar lacing woven in. Santa’s Christmas Sleigh is woven on fretwork base. Accents of miniature green garland and star garland woven into sides.